Art- Luke Ross turns in some awesome art with well proportioned characters and well choreographed battles. Story- In the past, after Jason Quantrell lost Quickfire in battle with the Mighty Avengers he enlisted the help of W.E.S.P.E scientists. Here they created a device which allowed him to look beyond the temporal/historical/true-event structure of the universe and the Beyond corporation took him over. In the present he reveals all this to Luke and Jessica Cage before tossing them into space. 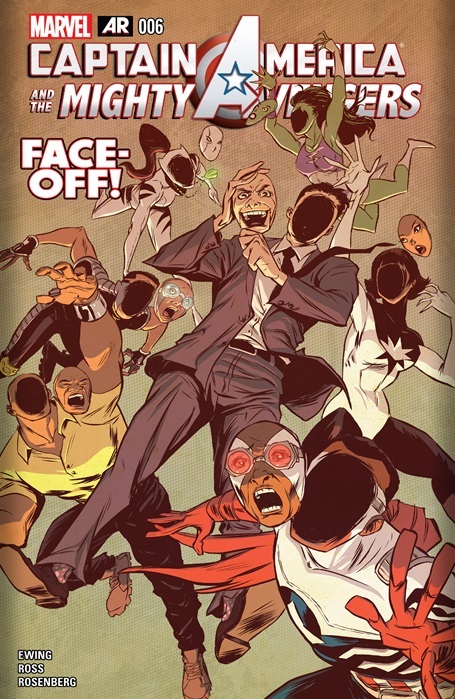 On Earth Quickfire has infected Power Man and White Tiger aided by Gideon Mace. All New Captain America, She Hulk and Kaluu try to contain them but only Cap is left uninfected. Blue Marvel grabs Cage and his wife from space and heals them. Monica Rambeau then recalls things that had happened to her which others said didn’t she transforms into her retro look and prepares to take the fight to the enemy! Blue Marvel– This guy needs his own series! Marvel needs to make it happen! Spectrum– So for all who lambasted Spectrum’s re-design you can rejoice she’s back to the natural hair and the trench coat. Threat– The Beyond Corporation seems like an interesting concept that if executed correctly could rival the Builders from INFINITY. Let’s see how this unfolds! Quickfire/the Mcdevitt thing’s infectious drama is equally compelling simply because unless All New Captain America gets some serious help if we are expected to buy him beating Kaluu, White Tiger etc. Cover– Washed out colors and it’s just plain bland. This series needs some quality covers to even be considered worthy of purchase. Underappreciated– It’s sad how many readers ignore or downright lambast this series. It’s not the greatest book ever written but it is decent enough and features the most diverse cast this side of the defunct Milestone comics that you should be supporting it! And thats the main reason why I’m still supporting it. Though I would like to see some changes made. Like fewer characters in the lineup, or the writer can just flesh out the existing ones more. Story is starting to get sleepy for me.